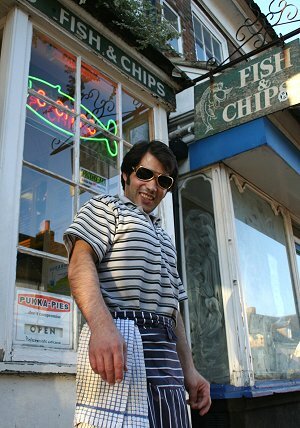 ARCHIVE: the day we found The King serving fish and chips in Highworth! Elvis Presley is alive in Swindon - and Kirsty MacColl saw it coming! 'There's a guy works down the chip shop swears he's Elvis' sang Kirsty in 1981. And if dear old Ms. MacColl was alive today we think these pics would bring a smile to her face - it did ours! Cod you believe it - we've found him! 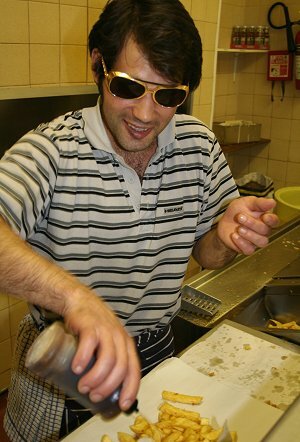 Antonio Andrade, 28, serves up the cod and chips at Smart's Fish and Chip shop on the High Street in Highworth, but on Friday nights, he swears he's the King of Rock 'n Roll. Antonio, who is originally from Portugal but has lived in Highworth for five years, likes nothing more than to impersonate his idol Elvis at karaoke nights - moves and all! 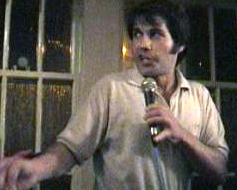 So if you're passing through Highworth on a Friday and stop by the Rose & Crown, it's likely you'll hear him crooning to 'Suspicious Minds', 'Danny Boy' or 'In the Ghetto'. "I've only been into Elvis for about four years, but I am definitely a fanatic now," says Antonio. "My girlfriend first got me into it and I get down to the karaoke nights whenever I can. "American Trilogy is my favourite song to perform." And that's the wonder of Swindon!